About 687 BC, according to the Greek historian Herodotus, King Gyges started the new country of Lydia (LID-ee-ah), in modern Turkey where the Hittites had ruled before the Dark Age. Now that the Assyrian Empire had collapsed, and the Neo-Babylonians were not very strong, it was pretty easy for new countries to get started along the edges of the old empire. Gyges made his capital at the city of Sardis. From the time of Gyges (GUY-jeez) onward, the Lydians were pretty friendly with the Greek cities along the coast of Asia Minor (modern Turkey). 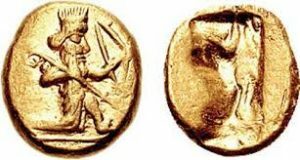 The Greek word “tyrant” may be derived from the Lydian word for “king”, and coinage may also have gotten started here. What does it mean to be a tyrant? Probably Greek soldiers fought as mercenaries for the Lydian kings. In order to pay their soldiers, the Lydian kings may have made small lumps of gold. And then to certify that the lumps were the right size, the king stamped them with his image. In 560 B.C., Croesus became the king of Lydia. Croesus (KREE-suss) was so rich that he has left us the expression “as rich as Croesus.” Herodotus talks a lot about King Croesus, who he says was a friend of the Athenian Solon. Who was this Solon guy? According to Herodotus, King Croesus seems to be pretty much telling the Greek cities of Asia Minor what they can do. The Lydians seem to have had power over the Greek cities near them. Then in about 550 BC, Cyrus the Great attacked Lydia with the Persian army. 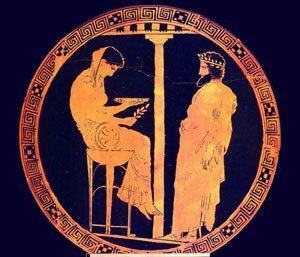 Croesus apparently sent a messenger to the Greek oracle at Delphi asking what he should do. 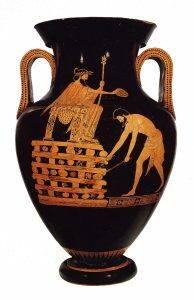 According to Herodotus, Cyrus took Croesus prisoner. He put Croesus on a big pile of wood – a pyre – and said he was going to set it on fire and burn Croesus up. But when he heard Croesus talking, he realized that Croesus was a really smart guy, like him, and he took Croesus off the pyre and made him his advisor. In the end, Croesus and Cyrus seem to have made some sort of truce. But after the death of King Croesus in 546 BC, the Persians really took over Lydia, and soon they began to control the Greek cities nearby too. In 499 BC the Greeks attempted to revolt, and succeeded in burning the city of Sardis, but by 491 the Greeks lost and came under Persian control. Early Turkey: An Introduction to the Archaeology of Anatolia from Prehistory Through the Lydian Period, by Martha Sharp Joukowsky and Jean Blackburn (1996). Joukowsky is a well-known expert in West Asian archaeology. Sardis from Prehistoric to Roman Times: Results of the Archaeological Exploration of Sardis, 1958-1975, by George Hanfmann (1983). Hanfmann is also a well-known expert on West Asia. The Persian Wars, by Herodotus. Straight from the Greek historian himself. Herodotus: And the Explorers of the Classical Age, by Ann Gaines (1993). Cite this page: Carr, K.E. Who were the Lydians? West Asian history. Quatr.us Study Guides, September 14, 2017. Web. April 20, 2019.